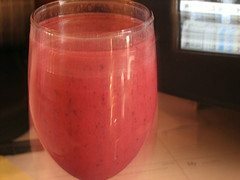 This is a popular smoothie recipe that comes in many different variations. I think you’ll dig the version I created below. As with any smoothie recipe I post, feel free to tweak to meet your needs. Here are a few reasons why consuming cherries on a regular basis is good for your health. They are an antioxidant powerhouse, and contain important nutrients such as beta carotene (19 times more than blueberries or strawberries) vitamin C, potassium, iron, magnesium, dietary fiber and folate. These vitamins and minerals offer much in the way of healing and prevention. Inflammation is at the root of many diseases. Cherries provide tremendous natural anti-inflammation properties that can be especially helpful for alleviating pain from illnesses like arthritis and gout. Athletes who consume cherry juice before and after physical exertion often experience a reduction in pain and recovery time. Cherries are also great for heart health. A study from the University of Michigan found a diet high in cherries lowered total weight, body fat (especially the important “belly” fat), inflammation and cholesterol, all of which are risk factors associated with heart disease. Still not sold on cherries, find out more at choosecherries.com. If you use frozen fruit you probably won’t need to include ice cubes. Enjoy! Toss the ingredients into your high-speed blender and blend on high until desired consistency is reached.